Guru Angad Dev, called Lehna at birth, was born in the month of Vaisakh on 1 Vadi, or first day of waning moon, year 1561 of the Vikram Samvat (SV) calendar which corresponds to March 31, 1504 of the Julian Calendar. 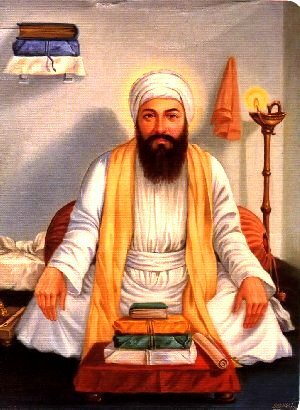 When converted to the modern day Gregorian calendar, Guru Angad Dev Ji's birth or prakash took place April 18, 1504 A.D. In year 544 of the *Nanakshahi Sikhism calendar, Guru Angad Dev's birthday prakash gurpurab is calculated to be observed on 18 April2012. Guru Angad invented the present form of the Gurmukhi script. It became the medium of writing the Punjabi language in which the hymns of the Gurus are expressed This step had a far-reaching purpose and impact. First, it gave the people who spoke this language an identity of their own, enabling them to express their thought directly and without any difficulty or transliteration. The measure had the effect of establishing the independence of the mission and the followers of the Guru. Secondly, it helped the community to dissociate itself from the Sanskrit religous tradition so that the growth and development of the Sikhs could take place unhampered and unprejudiced by the backlog of the earlier religious and social philosophies and practices. This measure, as shown by the subsequent growth of Sikhism, was essential in order to secure its unhindered development and progress as it required an entirely different approach to life.